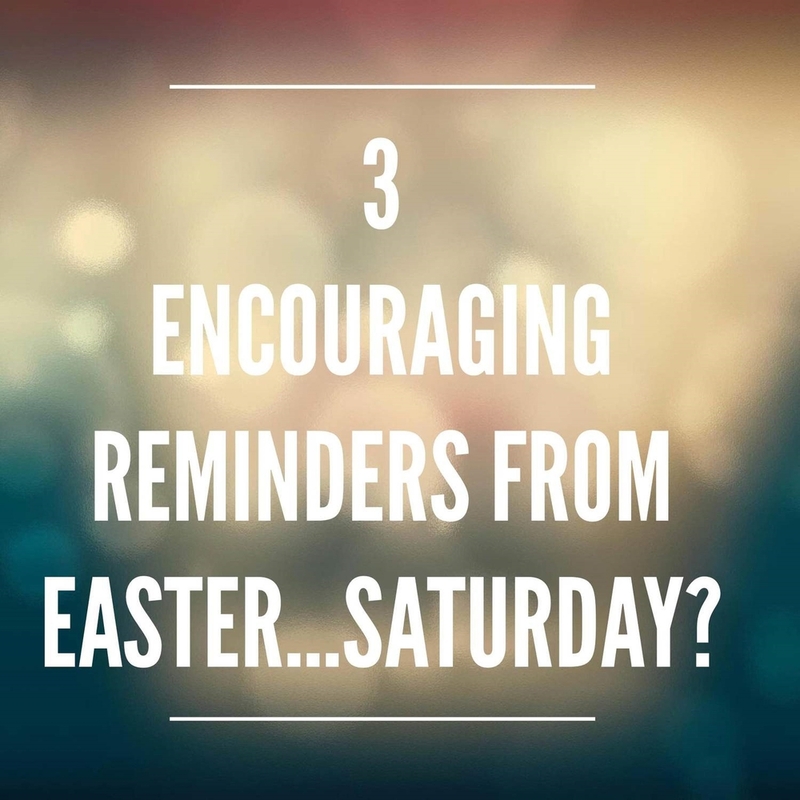 3 Encouraging Reminders from Easter...Saturday? Saturdays are the best day. I enjoy being lazy and unplugging from reality. One reason I love Saturday is because it a cheat day for me diet wise. I eat more terrible food that one day than all week combined! There is one Saturday during my year that I approach a bit differently: the Saturday before Easter. As a believer in Christ, I understand the significance of Easter weekend. On Good Friday we remember the price Jesus paid on the cross and that our past can be forgiven. On Sunday we celebrate that Jesus was resurrected back to life after being dead for three days and that our lives have significance because of that same power. But Saturday is often forgotten. We do not talk about Saturday. There are no sermons on the events of that Saturday 2,000 years ago. If we pause and think about it, we can gain some encouragement from that Saturday of the first Easter weekend. Here are 3 reminders from that day. It reminds us God does not judge our performance. My friend Dave recently tweeted, "'Try harder. Earn it. You're not religious enough.' #ThingsJesusNeverSaid" I love this thought. When I think of those followers of Jesus who sat and mourned his death I notice that they were totally complacent. They did nothing impressive, saw no healings, and witnessed to no one on the Saturday before Easter. They did nothing. Yet, these same men and women went on to establish the church we call home today. Aren't you grateful that Jesus neither expects us to earn our way into heaven or to suffer punishment for our times of complacency? Quite the opposite is true. Jesus redeems us despite our actions and uses us in spite of our unproductive times. It reminds us we are not alone. When I think of those 24 hours that followed the crucifixion, I imagine groups people sitting in living rooms and around kitchen tables with hopeless looks on their faces. While their feelings and emotions were destitute, there was likely one thing that kept them strong: each other. People found comfort and strength in one another. Anyone who has walked through a loss or pain knows that the secret to survival is to be with people. Sometimes it can be people who are there to encourage you, other times it may be the people you are mourning with. The Bible gives us a peek at an early church who understood this. It says, "Because we loved you so much, we were delighted to share with you not only the gospel of God but our lives as well." in 1 Thessalonians 2:8. In good times and in bad, we need other people. We are not alone. It reminds us what to do when we feel stuck. I often try to put myself in the place of characters in the bible. I wonder what I would do in certain situations, how I would think, what I would feel, if I would be the illustration of what to do or not to do. No doubt I would've tried to walk to Jesus on the water and I would have without question ran the other way from Goliath! When I think of how those followers of Jesus felt on Saturday, I would have felt stuck, lost and abandoned. The past several years of my life may have been in question. What do we do in those moments? The answer is so simple that it is irritating. In those moments, we trust. When we feel most stuck in life is when we should trust God. Waiting and trusting are not feel good terms and do not inspire. What they are is faith terms. Getting unstuck often times requires action, but every time requires faith. Where do you feel stuck? Are you leaning in and trusting God in that area? Hopefully you will enjoy your Easter weekend. As you move through your Saturday and into Sunday, I hope that you are encouraged. Jesus has paid the price for you and is more than enough to make your life complete.